This article is about the Mexican city. For other uses, see Saltillo (disambiguation). 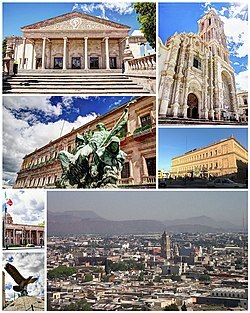 Saltillo (American Spanish: [salˈtiʝo] ( listen)) is the capital and largest city of the northeastern Mexican state of Coahuila and the municipal seat of the municipality of the same name. 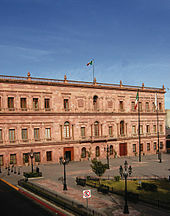 As of the 2015 census, Saltillo had a population of 807,537 people, while the population of the metropolitan area was 923,636 inhabitants, making Saltillo the largest city and the second largest metropolitan area in the state of Coahuila and the 19th most populated metropolitan area in the country. ^ INAFED (Instituto Nacional para el Federalismo y el Desarrollo Municipal) (2005). 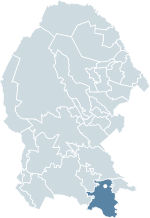 "Saltillo, Coahuila". Enciclopedia de los Municipios de México (in Spanish) (online version at E-Local ed.). Secretaría de Gobernación. Archived from the original on May 20, 2007. Retrieved 2008-03-28. . 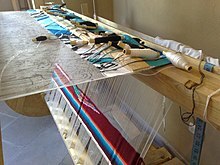 The Tlaxcalteca community remained legally separate until the 19th century. ^ "COAHUILA, PRIMER LUGAR NACIONAL EN PRODUCCIÓN AUTOMOTRIZ". Retrieved 2007-12-01. ^ "Museo de las Aves de México". Retrieved 2007-12-01. ^ "Museo del Desierto". Retrieved 2007-12-01. ^ Torres, Robert (2009-12-25). "Canton creating Sister Cities in Israel, Mexico to encourage investment". cantonohio.gov. Director of Development. Retrieved 2015-01-23. ^ "Magda Guzmán". The Internet Movie Database. Retrieved 2011-10-27.